When it comes to the ceiling of your home, one of the worst things that can happen to it is being exposed to water or moisture. Any time water is allowed to sit on a surface for even the shortest amount of time, it can cause major damage that is often irreversible. 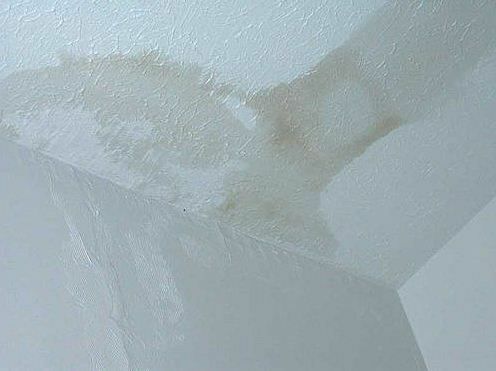 You may have noticed that your popcorn ceiling has been the victim of water damage. If so, the damaged area will need to be dealt with in order to eliminate the stain and the potential for any mold to grow in the presence of moisture. First and foremost, the water issue needs to be rectified before popcorn ceilings can be repaired. If there is still water leaking in, this will only continue to cause problems and require you to make additional repairs in the future. The most effective way to eliminate the area that’s been damaged by water is to scrape, patch, and paint it. This process starts with a quick repair of the area in question. If you are considering doing this yourself, make sure that you wear a protective mask before starting. However, it should be noted that this technique should only be opted for if you want to continue to keep your ceiling covered in sprayed on stucco. Next, a scraper tool will be needed to scrape off the stained popcorn ceiling material, going approximately one inch all around the stain. Scrape until only the flat drywall can be seen. It’s likely that the drywall may have a water stain on it as well. If that’s the case, you may want to get a certain product to paint over the water-stained area on the drywall. Once the water leak has been fixed, popcorn ceiling patch material can then be applied, making sure to match the texture and thickness of your existing popcorn ceiling. After the product dries, it can then be painted in the same colour as the remainder of the ceiling. Forgo Your Popcorn Ceiling With a Smooth Finish while the patch technique can certainly work, it will still leave you with that outdated popcorn ceiling that is tough to keep clean. Perhaps the water stain on your popcorn ceiling is your chance to redo the entire surface in favour of something smoother and more modern. Rather than scraping just the damaged area, the entire popcorn ceiling surface can be scraped. The surface can then be repaired and smoothed out, after which it can be painted in the colour of your choice. However, scraping popcorn ceiling material can be very time-consuming, labour-intensive, and can even put you in harm’s way if there is any asbestos in the material. Once you scrape it off, all the particles will become airborne. If there is even the remote chance that asbestos exists in your popcorn ceiling, this job should be referred to professionals in the business of removing popcorn ceilings and replacing them with something more stylish. Specialists today to replace your popcorn ceilings with something much more attractive that will improve the esthetics of your home’s interior.